If you think of boring and static paintings when you hear the words “still life,” the Hallie Ford Museum of Art is going to expand your mind and imagination in the coming months. 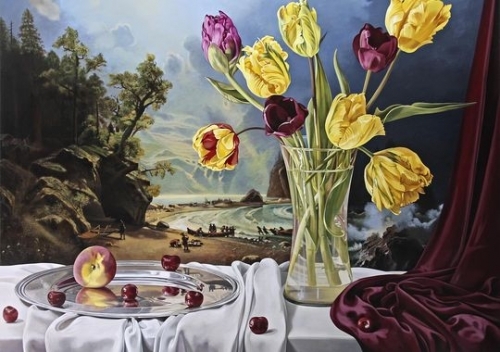 Sherrie Wolf: Object Lessons, an exhibition of paintings, prints and other works on paper, will be on exhibit Saturday, Aug. 1, through Oct. 25 at the Hallie Ford Museum of Art, 700 State St. Wolf juxtaposes exquisitely rendered still-life compositions with Old Master themes. John Olbrantz, Hallie Ford’s director, organized the exhibition. “She offers a fresh approach to the still-life genre that is unique in contemporary art, and that places her work at the forefront of a long and distinguished tradition that dates back to the late Gothic period and even earlier,” Olbrantz said. Born and raised in Portland, Wolf graduated from the Pacific Northwest College of Art before attending graduate school at the Chelsea College of Art in London. She taught at Pacific Northwest College of from 1978 to 1985. Wolf will give a free lecture about her work at 5 p.m. Sept. 11 at the Paulus Lecture Hall, Willamette University College of Law, 900 State St. Object Lessons is a teaser for Hallie Ford’s upcoming exhibition of 27 artists’ diverse approaches to contemporary still life that opens Sept. 12. Admission is $6, $4 seniors, $3 educators and college students (18 and older with school ID), and free for youth, museum members, Willamette University students, faculty and staff. Admission is free for all on Tuesdays. For information, call (503) 370-6855 or go to willamette.edu/arts/hfma/.